Anxiety disorders are the most common mental illness in the US, affecting 40 million adult Americans. 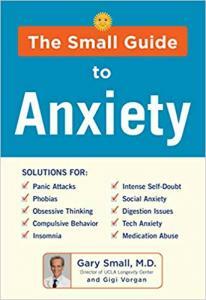 This accessible guide starts with providing readers with an overview of anxiety: what it is, who gets it, how to recognize it, major causes (genetics, environment, etc. ), and how a small amount of anxiety can actually help motivate us along with the dangers of letting more severe anxiety go untreated. Dr. Small discusses the various types of anxiety, general therapeutic approaches used for all anxiety disorders, and how to know when it’s time to seek professional help. Each of the other chapters will cover a specific anxiety disorder (panic, OCD, etc.) and open with a case study example. Small will describe causes, symptoms, conventional treatments (e.g., medications, psychotherapy), alternative therapies (e.g., exercise, meditation, yoga, homeopathy), and novel therapies (e.g., transmagnetic stimulation [TMS]), as well as new scientific discoveries and interventions coming down the pike (e.g., focused ultrasound). In addition to case studies and patient interviews, all chapters will include side-bars with factoids, lists, and other helpful information. "Translates the latest scientific discoveries into an entertaining, accessible, and practical roadmap to an anxiety-free life."